Photo: Dean Buscher/The CW -- © 2016 The CW Network, LLC. All Rights Reserved. 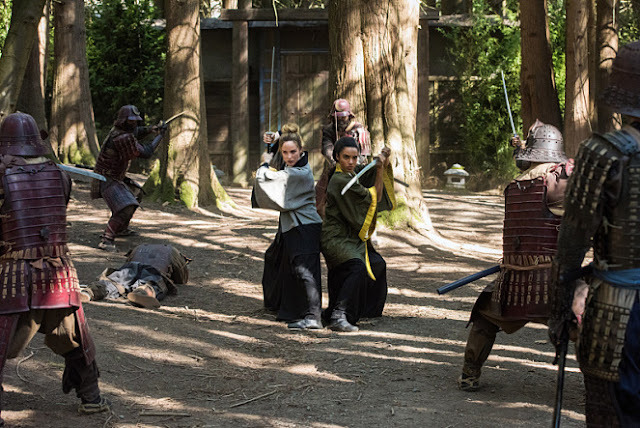 DC’s Legends of Tomorrow is heading to Feudal Japan in tonight's episode, "Shogun." The CW has released a new sneak peek that sees the debut of Nate Haywood (Nick Zano) as Citizen Steel and Vixen (Maisie Richardson-Sellers) has Heat Wave (Dominic Purcell) in her crosshairs. Thanks to Ray Palmer’s (Brandon Routh) serum, Haywood develops super powers that allow him to transform himself into metallic form. His transformation couldn't come at a better time because Vixen believes Mick is responsible for Hourman's (Patrick J. Adams) death and nothing will stop her to avenge him. The CW also released a behind-the-scenes featurette for the episode. Executive producer Marc Guggenheim explains the trouble the Legends are in when Ray's armored suit falls into the hands of the Shogun. "Shogun" episode of DC's Legends of Tomorrow airs Thursday, October 27 at 8 p.m. ET/PT on The CW.